It’s another testament that human and pet dog would do everything to protect each other, even at the risk of one’s life to save the other. Sadly a woman’s story with her dog ended in tragedy. She was killed at a private resort on the South Carolina coast on Monday trying to protect her dog from an alligator, but she ended up being dragged into the greenish water by the 8-foot alligator. Authorities have identified the victim as 45-year-old Cassandra Cline who was then vacationing at her rest house near Hilton Head Island. A neighbor, Thomas DiMaio, who stays in a rented house across the street where the attack took place, said he thought he heard shrieks when he was in the shower that fateful day but dismissed the noise as possibly merely coming from a bird. It took him another half an hour before he went outside. By that time, there was already a crowd that gathered beside the road. Found on the road was a bag of dog treats Cline had been carrying, one of her shoes and her hat that dotted a trail leading to the water. David Lucas, a spokesman for the South Carolina Department of Natural Resources gave a more complete picture of the tragedy that befell Cline. He said: "She was walking the dog near the lagoon and the alligator came out of the water and tried to get the dog. The lady tried to rescue the dog and a maintenance worker ran over to help." Cline and the maintenance worker joined forces to try to help save the dog, but the alligator dragged the woman into the water instead. Lucas has yet to elaborate if any effort was still done to help and rescue Cline from the alligator, or if the maintenance worker immediately alerted anyone else. Or if things just went out of control so fast. The 8-foot or 2.5-meter alligator was later found and killed. Capt. 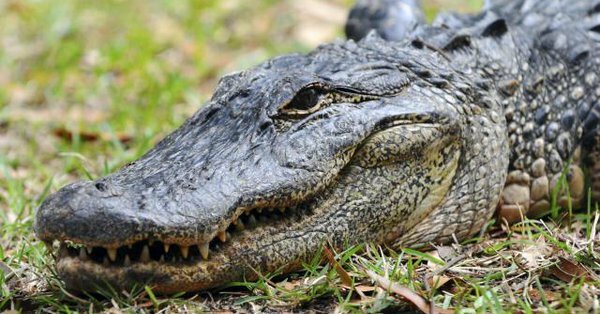 Robert McCullough of the Department of Natural Resources said, however, that it will take some time before authorities determine if the alligator shot Monday is really the one that killed Cline. Residents say alligators are a common sight in the resort island. The dog was unharmed. A neighbor is temporarily taking care of Cline’s pet, while it was sitting on Cline’s front porch. He said he used to see Cline and her dog take walks twice or thrice a day, and she was always carrying a bag of treats for her pet. He said she was a very pleasant and friendly woman.